Type: BOOKS. Detail: Andriasyan, Z. Product Code: 9789056915551. Category: OPENING KPS. Publisher: . 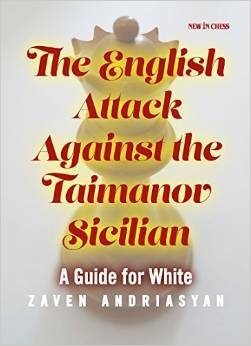 The Taimanov Sicilian is a chess opening widely played at club level and a favourite of elite players like Garry Kasparov, Vishy Anand and young star Anish Giri.Against this variation, the ever popular English Attack has long been considered harmless, until in recent years some remarkable improvements were found for White. By castling queenside White creates exciting positions in which he has a dangerous initiative.Armenian grandmaster Zaven Andriasyan has thoroughly and systematically investigated this unexplored chess opening territory. He unveils the structures behind the various lines and explains the plans and counterplans.Andriasyan also presents a wealth of highly interesting new ideas and novelties, and provides the reader with 50 exercises.Amateur chess players will find the English Attack to be an easytograsp and dangerous weapon. Play 2...Nf6 in Sicilian HB. Bogdanovic. $34.95.